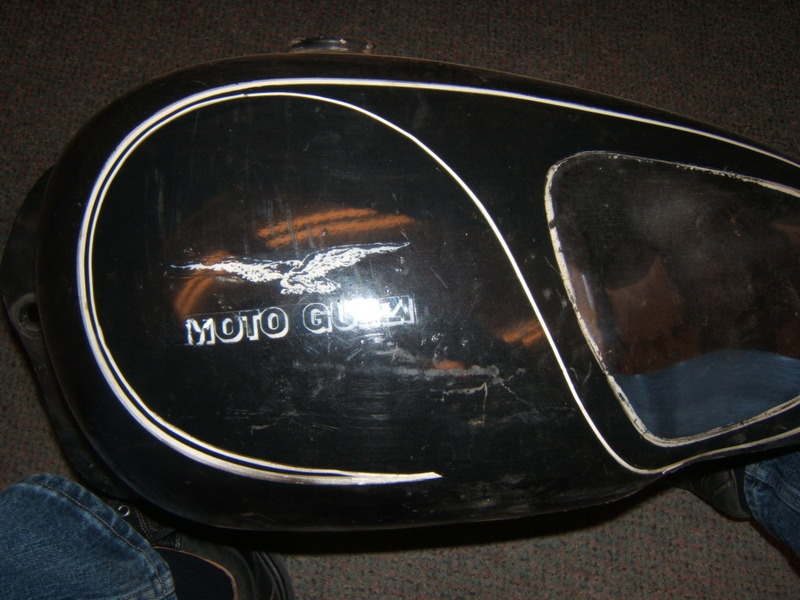 First off, the original shape of the chrome panel was NOT the same across all tanks. Not only are there large differences between the early V7/V700 tank and the later Ambassador and Eldorado tanks (plus plenty over overlap between), but there are minor differences between any two tanks that came off the production line next to each other and even differences between the left and right sides of an individual tank (not a mirror image). So, there is no rosetta stone that will give you the single exact shape that came from the factory. 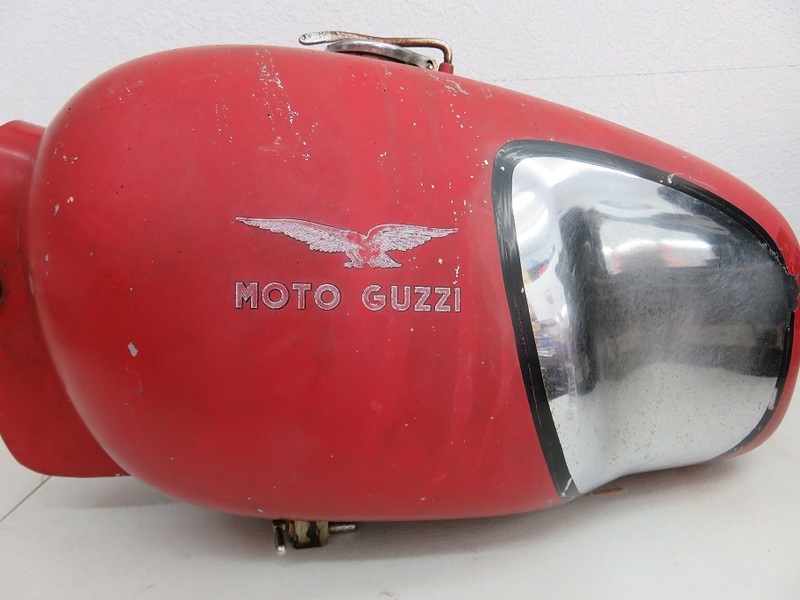 Mark Etheridge of Moto Guzzi Classics uses a matched pair of magnetic shapes (his favorite shape chosen from many) so that all you need to do is position them, mark the outline, and remove. The shape of early V-700 and Ambassador chrome panel is different compared to the later model Ambo and Eldorado. The template is actual size and was made using a mask from early Ambo tank with forward fuel taps. It is identical to the re-chromed V-700 tank shown in the pictures. The V-700 strip has shown up in photographs as black or white, narrow. I chose narrow – black. Comparison of the V700 and very early Ambassador tanks. Making the template for the chrome panel. V700 tank after chroming and painting. Shape of the chrome panel on the V700 tank. I gleaned this information from Jim Carey off of the Yahoo! 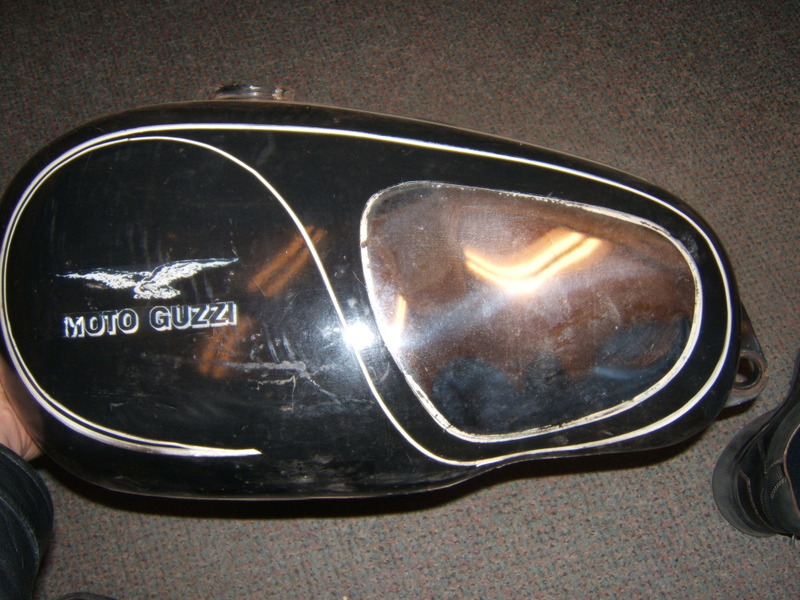 Loopframe_Guzzi news group. 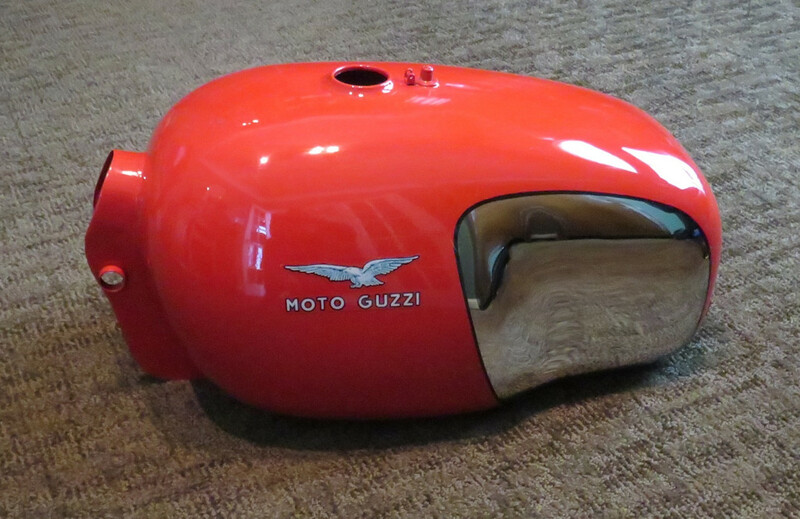 Original pin striping on the fuel tank: side view and chrome panel. Photo courtesy of Jim Carey. A method I've used is to mask off the chrome panel and scuff up the tank chrome with 400 or 600 wet and dry, being careful around your panel mask. 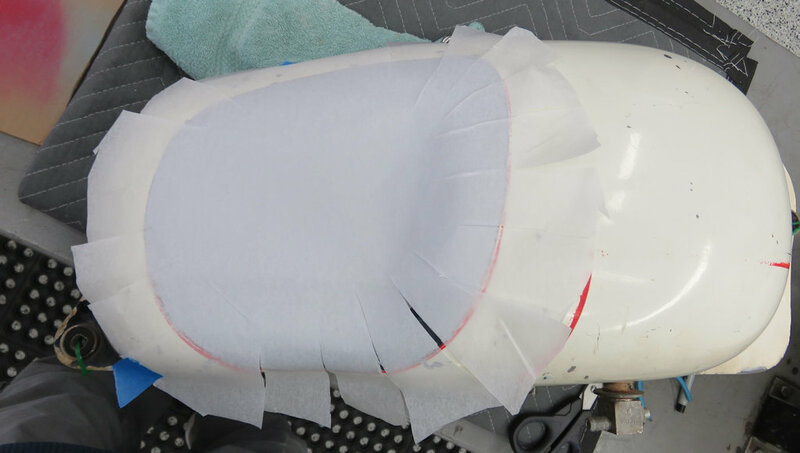 When you're done with this, take a 1⁄4 inch wide striping tape and lay it half over the mask and half over the scuffed up tank and paint the tank. What you're doing here is creating a 1⁄8 inch scuffed edge around the chrome panel for your striping paint to get a bite into. Use One Shot sign painter's paint for striping. When you peel everything off you should be left with a shiny chrome panel with a 1⁄8 inch sanded chrome ring around it, which is covered half and half with the 1⁄4 inch pinstripe that laps the chrome and the paint. Shape of the chrome panel on the Ambassador, Eldorado, and V7 Special tank.